Budge was a prolific author, and he is especially remembered today for his works on Egyptian religion and his hieroglyphic primers. Budge's works were widely read by the educated public and among those seeking comparative ethnological data, including Sir James George Frazer, who incorporated some of Budge's ideas on Osiris into his monumental work entitled The Golden Bough. Budge's works on Egyptian religion have remained consistently in print since they entered the public domain. The following myth is taken from ancient Egyptian Texts that were translated by Budge and published in his book entitled: Legends of the Gods (London, 1912). it by Chabas, who in 1857 gave a translation of it in the Revue Archeologique, p. 65 ff., and pointed out the importance of its contents with his characteristic ability. The hieroglyphic text was first published by Ledrain in his work on the monuments of the Bibliotheque Nationale in Paris, and I gave a transcript of the text, with transliteration and translation, in 1895.
the light above the darkness. which even under the XVIIIth Dynasty was very ancient, Isis, we are told, was the constant protectress of her brother, she drove away the fiends that wanted to attack him, and kept them out of his shrine and tomb, and she guarded him from all accidents. All these things she did by means of spells and incantations, large numbers of which were known to her, and by her power as the "witch-goddess." Her "mouth was trained to perfection, and she made no mistake in pronouncing her spells, and her tongue was skilled and halted not." At length came the unlucky day when Set succeeded in killing Osiris during the war which the "good god" was waging against him and his fiends. Details of the engagement are wanting, but the Pyramid Texts state that the body of Osiris was hurled to the ground by Set at a place called Netat, which seems to have been near Abydos. [FN#26] The news of the death of Osiris was brought to Isis, and she at once set out to find his body. All legends agree in saying that she took the form of a bird, and that she flew about unceasingly, going hither and thither, and uttering wailing cries of grief. At length she found the body, and with a piercing cry she alighted on the ground. The Pyramid Texts say that Nephthys was with her that "Isis came, Nephthys came, the one on the right side, the other on the left side, one in the form of a Hat bird, the other in the form of a Tchert bird, and they found Osiris thrown on the ground in Netat by his brother Set." 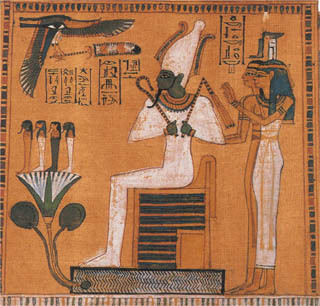 The late form of the legend goes on to say that Isis fanned the body with her feathers, and produced air, and that at length she caused the inert members of Osiris to move, and drew from him his essence, wherefrom she produced her child Horus. have made for thee is warmth. Adoration to thee, O Osiris! The doors of heaven are opened to thee, the doors of the streams are thrown wide open to thee. The gods in the city of Pe come [to thee], Osiris, at the sound (or voice) of the supplication of Isis and Nephthys . . . . . Thy elder sister took thy body in her arms, she chafed thy hands, she clasped thee to her breast [when] she found thee [lying] on thy side on the plain of Netat." "Thy two sisters, Isis and Nephthys, came to thee, Kam-urt, in thy name of Kam-ur, Uatchet-urt, in thy name of Uatch-ur . . . . . . . Isis and Nephthys weave magical protection for thee in the city of Saut, for thee their lord, in thy name of 'Lord of Saut,' for their god, in thy name of 'God.' They praise thee; go not thou far from them in thy name of 'Tua.' They present offerings to thee; be not wroth in thy name of 'Tchentru.' Thy sister Isis cometh to thee rejoicing in her love for thee. Thou hast union with her, thy seed entereth her. She conceiveth in the form of the star Septet (Sothis). Horus-Sept issueth from thee in the form of Horus, dweller in the star Septet. Thou makest a spirit to be in him in his name 'Spirit dwelling in the god Tchentru.' He avengeth thee in his name of 'Horus, the son who avenged his father.' Hail, Osiris, Keb hath brought to thee Horus, he hath avenged thee, he hath brought to thee the hearts of the gods, Horus hath given thee his Eye, thou hast taken possession of the Urert Crown thereby at the head of the gods. Horus hath presented to thee thy members, he hath collected them completely, there is no disorder in thee. Thoth hath seized thy enemy and hath slain him and those who were with him." The above words are addressed to dead kings in the Pyramid Texts, and what the gods were supposed to do for them was believed by the Egyptians to have been actually done for Osiris. These extracts are peculiarly valuable, for they prove that the legend of Osiris which was current under the XVIIIth Dynasty was based upon traditions which were universally accepted in Egypt under the Vth and VIth Dynasties. Keb, and to the welcome which he received from the Tchatcha, or Administrators of heaven, and the Company of the Gods, and the Lords of Truth, who assembled in the Great House of Heliopolis to acknowledge his sovereignty. His succession also received the approval of Neb-er-tcher, who, as we saw from the first legend in this book, was the Creator of the Universe.